Of Senegalese and West-Indian descent, Meryanne Loum-Martin was educated in Paris. By the age of thirty, she had travelled, explored, worked and lived in five continents and has received prestigious awards across her diverse career paths, from law to later hospitality and interior design. In 1978, Meryanne graduated from the University of Paris Law School and became a member of the Paris Bar. Within a year of being sworn in, she won the Prix des Secrétaires de la Conference du Stage representing the Paris Bar in international debate competitions. Meryanne moved to Marrakech in December 1985 finding passion in its rich culture and history. Four weeks later, she embarked on her first development project, Dar Tamsna villas, whose cutting edge approach to a high-end tourism led to the Harpers & Queens award for “Best Private Villa in the World” and The Wall Street Journal Europe to deem her "the first one to create a new type of tourism that appeals to affluent Western society.” In 1999, she opened an innovative cultural concept store, Ryad Tamsna, in the Medina, landing on the cover of Departures with the caption: “The Essence of Chic.” In 2001, she opened the renowned Jnane Tamsna, a luxury boutique hotel with an eye to cultural and philanthropic endeavors including support of The Global Diversity Foundation. Her next project is a luxury sustainable development in the countryside of Marrakech, including a boutique hotel managed by a prestigious sustainable brand and 25 villas available for purchase. From hospitality and design to green development and art, her interests are as diverse as her countries of origin. 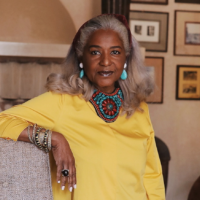 Her passion for developing opportunities rooted into cultural heritage and conservation, leveraged by the highest international standards, has established her as the pioneering reference for boutique hospitality in Marrakech. She is the co-founder and director of development of the African Hospitality Development Group; she sits on the boards of the Marrakech Art Biennale, founded by Vanessa Branson, and The Observatoire de la Palmeraie, the conservation arm of the Fondation Mohammed VI pour la Protection de l' Environnement; she is the only foreign female commissioned by Meissen, the 310-years old German porcelain company to design a collection titled the “Garden of Marrakech.” She has been featured in international publications including The New York Times, The Wall Street Journal, Architectural Digest, Condé Nast Traveller, Elle Décor, Coté Sud, The New York Times, Town & Country, French Vogue, Italian Vogue, British Vogue, German Vogue, among others. Currently, she is writing a book on her journey through design and architecture in Marrakech to be published at the end of 2019 by Rizzoli Publications. For 2020, she has partnered with Mashariki Williamson to launch a yearly event sponsored by IFFAC to celebrate the creativity of the African diaspora from fashion, art, film to literature. The annual event will take place in Marrakech the last week of February.